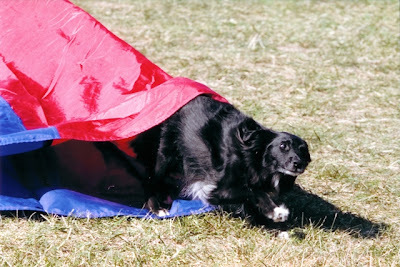 This weekend the 2007 FCI Dog Agility World Championships are being held in Hamar, Norway. These are the best of the world!! All the news and results - as they are happening from the official website! Great vids, news and results from Eric Larson! Be sure and check out the USA large dog team as they wrapped up the Silver today! One of best buds suggested that we make a Squidoo lens on how to find out how old your pup is in human years. So what did we do? Yep, we made one! In the course of making the lens we included some vids of pups from ages 1 through 18; guess who was the vid representing age 8? Yep, our very own buddy Spencer! We also found this really cool vid of a pup from the age of 7 weeks to 6 months that we thought you would enjoy! And don't forget to check out my lens "How Young is Your Dog?" 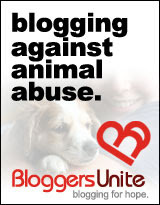 Today is Bloggers United Against Abuse Day. There is so much abuse in the world today for 2 and 4-leggers, we really don't know where to begin. For now, we choose to blog for the animals - my species, my kind. I have been a victim of abuse. It was almost a year ago. Even though those that abused me when I was away from my Mum, still to this day do not believe what they did was abuse, I am sure. Just as I am sure it happens with others every day of every year. But it happened, and it was. There are far too many much more severe cases of abuse that happen every day, than what happened to me. I was the lucky one. What it did was make me think, make me more aware, make me become more educated, and make me, my Mum and my sister Gracie, want to help however we can. To honor what I went through last November and for all of those that suffer every day, my loving sister, Gracie created a SixDegrees.org AIM page to support the Animal Legal Defense Fund. It was and is a way for all of our family to try to help make things just a little bit better if we can. Stop by her page if you get a chance and read about the good work the folks at the Animal Legal Defense Fund are doing to help stand up for the rights of all animals. With nearly 62 million dogs in households throughout the US, you can bet your pups are leaving their paws prints on the environment. So what can you do? Help your dog go green! By purchasing environmentally responsible pup products, utilizing environmentally safe household cleaners, and by taking other sustainable measures, you can have a healthier and happier pup, and help the environment at the same time! 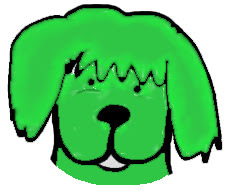 Visit my new Squidoo lens on Raising a Green Dog! It's packed full of information on how you and your pup can go green, be healthier and happier and help the environment at the same time! We were searching around today and found out about a new search engine with a bit of a difference. You input your search term and it searches the main search engines, then it allows users to vote for their favorite websites. It's kind of a personalized social networking search engine with user-ranked results. Of course I went right in a searched for my favorite thing - dog agility. My Squidoo lens appeared on the front page, which I love. And I saw all my other favorite sites and started right in voting on them. Kind of a Digg meets Google. Interesting, click here to try sproose. Well, duh! There are ear thermometers! The nice folks over at my shelter, the Southside Animal Shelter, barked in this morning to tell me and Mum about the ear thermometer. Duh!!!! Mum didn't have one of these handy things available for Gracie the other day, but you can bet we are gonna have one in the mail pretty darn soon. 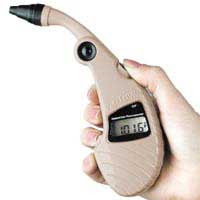 That just seems so much more comfortable, and I bet loads easier for one person to handle taking pet temps with this handy, dandy, and reasonably priced device. Check it out, wouldn't that be a great thing to add to your pet first aid kit. 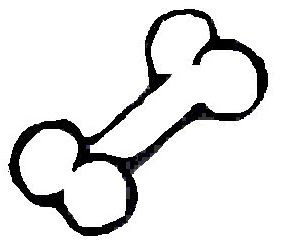 Clare, over at Dog Topics, has been keeping information posted on her blog about dog toys coming from China, suspected high levels of toxins and heavy metals, and the affects this could have on us pups. You need to paw on over there when you get the chance and keep up-to-date. She has really great info! Thanks Clare for keeping a watchful eye on this growing concern. The other day, Gracie came down with a real runny nose. It was clear fluid, not gunky or greeny (yuck!). So Mum didn't worry too much - 'cause gunky and green can mean an infection. There was only one thing that happened in the days before that Mum thought could have affected Gracie's nose. Mum put down new organic fertilizer (with blood meal) and it smelled pretty good to Gracie. She really didn't eat it, 'cause the pellets were very small and Mum watered it in real well. But she still sniffed a lot and our best guess is it irritated her nose for the day. 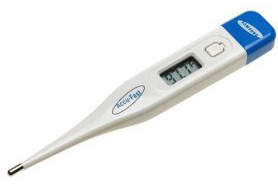 One thing that Mum did to see if she had an infection causing her runny nose was to take her temperature. I have to tell ya, Mum's never taken our temperature before, and has only watched as our vet has done it. But she decided it was time to learn and did some research on the Internet. She also got our rectal thermometer out of our trusty first aid kit that she takes everywhere with us. And a little packet of lubricant to make the 'slide in' easier. After gettin' educated, Mum got Gracie to cooperate and took her temp. We do recommend that two people do this, as it was kind of difficult for Mum to do it on her own, with strong Gracie. But Gracie was a good girl. She followed the directions and Gracie's temp was completely normal - 100.5 degrees. So we felt a lot better knowing that Gracie wasn't really sick, just had an irritated nose. You all know it's important to check with your vet on such matters. Mum did throughout the day when Gracie got the runny nose. But it's good to know how to take your dog's temp and pulse to help assess the situation, communicate more information to your vet and make more informed decisions. When Mum and I were at the trail this weekend there were a couple of companies taking photos. Mum loves going to look at the photos, mostly because she sees things that went on in our runs, that she can't see when she's running me. And because she just loves looking at me, BOL!!! This was an interesting pic. During our Standard run on Friday (when we got the big MX) there were two jumps coming out of a tunnel, from one jump to the next was a 90 degree turn and then the chute was right there. Mum remembers me almost blowing past the chute, but taking a quick, quick turn and making it in the chute, just in time. What she didn't see, however, was how I came out of the chute. And the fact that I didn't hesitate one iota going on to the next jump and a 90 degree turn into the weaves. So when she saw this pic, she was pretty surprised. It's not the usual way I come out of the chute, halfway going over on my side. But she loved the intensity, and the fact that it didn't hurt me, whew!!! Since Mum's a marketing consultant to technology companies she's always reading about local technology companies. She was reading recently about a tech company in town that does some pretty stuff. It's called Vontoo voice messaging. Vontoo helps you create, send, and track voice messages to people who want to hear from you, like customers that have opted in to receiving news and other types of communications. It doesn't require the additional purchase of software or hardware to use the technology. And I would expect it to be a little more efficient than email and more personal in some ways. I also like the fact that it is permission based and satisfies and follows the national and local Do-Not-Call regulations. Vontoo is working with the Boston Celtics to help them increase game attendance. And it seems to be working as described on their site. 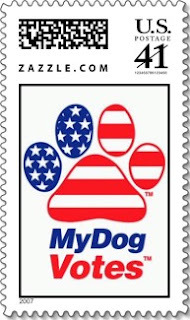 This would be such a cool thing to occasionally send some woofs to our JohannTheDog.com customers. Maybe use it to wish them Happy Holidays since the Holidays are just around the corner. Maybe I could even sing a little Howl-a-day song for them, like I do to the tornado siren every Friday at test time, and Gracie could woof in, too! This week is National Dog Week and National Deaf Awareness Week! This week is National Dog Week and National Deaf Awareness Week. In honor of these weeks we are bringing you some information about a really great organization - the Deaf Dog Education Action Fund. Meet Cookie! Cookie is an absolutely precious boy that is looking for his forever home. He is very well socialized, well mannered and knows several hand commands. Cookie knows hand commands for come, sit, stay, good boy, wrong, potty and go on. He loves to take rides in the car as well. Cookie is great off leash. He understands to check in if he gets a certain distance away. He would be a great agility or flyball dog as he is very motivated. Why does Cookie need to know hand commands? Because he is nearly or completely deaf in both ears. He is currently being cared for by the nice folks at Companion Animal Network in Dallas, Texas. And is listed through the Deaf Dog Education Action Fund who provides education and funding for the purpose of improving and/or saving the lives of deaf dogs. They are a non-profit organization founded to speak on behalf of and assist in the betterment of life for deaf dogs everywhere. Mum remembers the days when deaf dogs didn't have much of a chance in life. But now, through the efforts of many organizations and individuals, these pups that cannot hear can live a very healthy, happy, and fulfilling life. And they compete in sports and obedience, earn their Canine Good Citizenship awards, become wonderful therapy dogs and are cherished members of families throughout the World. All they need is a chance! Visit with Gwydion, a happy, healthy, active, accomplished and intelligent dog whose ears don't work. A great resource page for info on deaf pups -includes informational websites, training info, message boards, sign language sites and lots more. Find out more about deafness in dogs. Search out a deaf dog in need. Learn how you can help better the lives of deaf dogs. Read about training tips for these special needs pups. Spread the word that being deaf, doesn't mean life is over. We are back from the three day trial, and boy are we beat! Driving four hours each day kind of took a toll on all three of us - Mum, me and Gracie! But we still had a blast, met some new friends, spent some time with current friends, and got to do my favorite thing - agility! Today we are taking it easy, and Mum is spending loads of time in the chair with the computer, working to earn more of that money stuff. After Friday's spectacular showing, we totally went downhill from there. We ran Saturday Standard and JWW, and Sunday Standard and JWW, and not one Q. Some interesting stuff happened - I started pulling out of my weaves at the 10th pole, then I got a little spooked on the dog walk, and I completely ignored a jump on our last JWW run. Mum says, since she has started really pushing me out there, we got a little off our cues, and I was a little surprised at the change in Mum's way of pushing me out there. One time when I pulled out of the weaves, I just looked up at her like WHAT'S GOING ON HERE???? She gave me a wink, smile and then we bolted off to the next jump. With Mum giggling under her breath all the way. Mum expected a little adjustment period and knew that what I was doing and how I was acting was all connected to her pushing me harder, and that's OK. I like to be pushed! The best part was on our last run of the weekend and after pulling out of the 10th pole weave three times in a row, Mum put me back in the poles, and I did them great - then we were off to the finish of our JWW run and I was the happiest, fastest and most driven since my first run of the weekend! So Mum thinks we got over our little adjustment period pretty darn quickly, even in 90 degree heat. And it was totally worth working on this at a trial. Training tomorrow, then next weekend it's off to Terre Haute for a two day AKC trial. Mum says she's gonna continue to push me, so I guess I better be ready! a friend in Washington, get a dog." 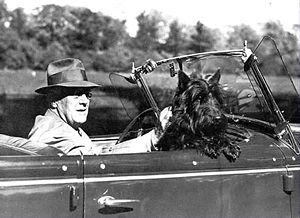 Roosevelt owned at least 7 dogs: a German Shepherd (Major), 2 Scotch Terriers (Meggie and Fala), Llewellyn Setter (Winks), English Sheepdog (Tiny), Great Dane (President), and Mastiff (Blaze). But the most famous of the pup class was Fala, given to the President by his cousin, Margaret Suckley, the star of an MGM Hollywood movie about the typical day of a dog in the White House. Fala also became an honorary army private, and received this honor by contributing one dollar to the war effort setting a trend for the rest of the US. Fala is depicted in the Franklin Delano Roosevelt Memorial. Meggie, the Roosevelt's other Terrier, was infamous as she once bit a senator! 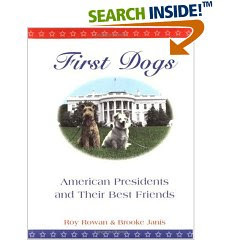 Throughout history dogs have played a very important role in the lives of Presidents. In Annapolis, Maryland is the Presidential Pet Museum, entirely dedicated to showcasing the lives and history of pets in the White House. It's a fun and educational site with interesting stories about how these Presidential pets played a role in the history of the US. And much has written about the role that dogs (and other pets) play in the lives of our Nation's leaders. Recently ABCNews published an article speculating on what pets would be taking over the Oval Office in 2009. The Time Tube blog recently asked, "How well do these five Presidential figures relate to their pet dogs?" Jake Tapper, a senior political correspondent for ABC News wrote not too long ago in the LATimes, "pets say something about our leaders -- just ask those on both sides of the debate over Mitt Romney's Irish setter." Recently, a woman who faced up to 90 days in jail for registering her dog to vote has agreed to a deal that could remove the charge from her record. 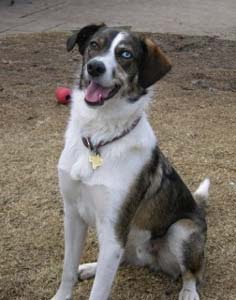 Balogh registered her Australian shepherd-terrier mix, Duncan M. McDonald, to vote in April 2006. Read more! To keep up on information about voting for dogs rights and the laws that govern our pups, here is an interesting blog providing a wealth of information. Dog Politics provides news, commentary and opinion on anti-dog law and policy. Download their guide to see if your candidate is dog friendly! And show your support with custom apparel, stickers, buttons and stamps! If you want to test your knowledge about dogs in politics, here's an interesting site! And what if our pets could vote? Who would they elect President in 2008? Would they vote Democrat? Republican? Or Independent? Well now they can!! Registration is free, fun, and easy. Register your pet today! Us pups, throughout the ages, have played very important roles in the history of the US. Here is a good example; a very historic speech, given by then Senator Richard Nixon. The "Checkers speech," as it has come to be known, was given by Richard Nixon on September 23, 1952, when he was the Republican candidate for the Vice Presidency. The speech was broadcast nationwide from the El Capitan Theatre in Hollywood, and was one of the first political uses of television to appeal directly to the populace. Nixon, having been accused of accepting $18,000 in illegal campaign contributions, gave the live address to the nation in which he revealed the results of an independent audit that was conducted on his finances, exonerating him of any malfeasance. The one contribution he admitted receiving was from a Texas traveling salesman named Lou Carrol who gave his family an American Cocker Spaniel, which his daughter named Checkers. Nixon admitted that this gift could be made into an issue by some, but maintained that he didn't care, stating "the kids, like all kids, love the dog and I just want to say this right now, that regardless of what they say about it, we're gonna keep it." We hope you enjoy Dogs in Politics Day! Today is One Web Day! Today, September 22 marks the 1st anniversary of One Web Day - A day for people throughout the world to celebrate the World Wide Web and how it connects us all. I am celebrating One Web Day today by sending this BIG THANK YOU HUG to all my pup and two-legger friends out there throughout the World. Thanks for being my friend, thanks for supporting me and my efforts, thanks for being on the Internet so I could meet you and share our lives together. Don't know what I would do without ya and I just wanted you to know that I appreciate you! You too can support One Web Day by talking about the affect the Internet has had on your life, by posting and sharing information, photos, and/or videos; emailing your friends and family, searching for information to improve your life and other ways, K? We're back from the trail today, And we have amazing news! We left today about 10:30 AM to drive over to Ohio for the trial, got there about 12:30. My first run was JWW and the course looked pretty good, Mum said. Nice place for those nice rear crosses we worked on last week. Mum set me up facing the tunnel, then it was four jumps with a rear to a jump and tunnel going left, then two straight jumps to the weaves, then a hard right to three more jumps and a rear (to the right) to six jumps in a row. Despite the fact that I was kind of wide on one of the rears and got near taking the tunnel the second time, our run was good! And we got a Q, so that got me and Mum my MXJ! Yippeee!!! Then Mum looked at the Standard course and thought, oh, no - may not get that DQ today or that MX, 'cause what she saw was something she hadn't seen yet, a macaroni tunnel with both ends with the Frame right in the middle - yep, you heard me a tunnel on either side of the frame, right up against it. And guess which obstacle was the fourth one, yep the Frame. It was three jumps with a hard left to the frame (missing those two tunnels on either side, mind you! ), then a right turn to a jump with another right to the dog walk, then the table. Then it was off to two jumps and the left side of that darn tunnel, then two jumps to the chute, another jump and a hard left to the weaves, to the left side of that darn tunnel. then a jump with a hard left to the teeter then two more jumps with the triple last. Well, we have to tell you that course ate up a bunch of dogs - all of them accept about 8 NQ'd. It was a toughie for sure. But guess what! Yep, we Q'd, one of three dogs in 16 inches, and to top that we even got 1st place. Very, very cool. A couple of things that Mum did that others didn't was very interesting. Many of the mini dog handlers were babysitting the frame, consequently they were bending over and throwing the pup into the out tunnel, or the dog would just stop in from of the frame, like what???? We watched a lot of dogs in 8 and 12 inches, but didn't see anyone really run how Mum had planned. And we were sixth into the 16 inch dogs, so we didn't get to really watch any of the 16's either. Mum's plan was to run with me on the three jumps, then when I landed in line with the Frame, she pivoted in place and said 'Frame', worked like a charm. No babysitting, just trusting me to know what to do, and I did. One other thing that she did was tell me all the way from the car to the start line - 'JoJo, three jumps to the Frame, buddy, Frame; yep that's it jump, jump, jump frame'. And, believe it or not, she thinks it really helped. Woo Hoo! I'm a Giant Squid! Not too long ago, Squidoo was having a bit of a contest. 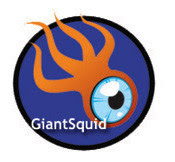 Those that had 50 really good Squidoo lenses done by a certain date were to possibly be named a Giant Squid! And yesterday they let everyone who made it know. And I made it! For those of you who don't know, Squidoo is a great site where you can create pages on any subject (or person) you want, and share in the profits that your lenses make! We're not making a huge amount of money, but it sure is great to have a little extra dough for agility, and to add to our pot to donate to dog shelters and rescues. 'Cause what we do it for all JohannTheDog related income, is donate 10% of the profits. Now that we're a giant Squid, we hope we'll be taking in a little more. If you'd like to see all my lenses, visit my lensography! Celebrities are always in the news. Neil Crespi on Squidoo even talks about celebrities. What are they up to, who likes whom, who got arrested today. Henry Kissinger once said, "the nice thing about being a celebrity is that, if you bore people, they think it's their fault." BOL! A celebrity is a widely-recognized or famous person who commands a high degree of public and media attention. A famous definition of celebrity comes from the cultural theorist Daniel Boorstin. In his book, The Image: A Guide to Pseudo-Events in America, he cynically describes celebrities as people well known for their “well-knowness”. I'm sure they would say that I'm smaller than they thought. And that I needed to loose a lb., or so, or that I was too thin, Ha! Surely they would say I was gossipy, because I'm always telling on my sis, Gracie. Outspoken, yes they would definitely say I was outspoken - I tell it 'like it is'. They would rate me pretty high on the fashion scale for a boy pup. 'What are you wearing, Johann? '; "EarthDog collars, of course," I'd say. "They are all natural, made of hemp and good for the environment." Hopefully they would think I'm a pretty good athlete, or at least have potential! The media is always giving celebs nicknames, I sure hope they would pick up on my my Mum's favorite nickname for me - JoJo (pronounced YoYo). My bet? They'd tell me I needed a good makeover, or maybe they'd go for my scruffy look. What would they say about you? It's only Wednesday and already I'm thinking about the weekend! Awww, agility, one of my favorite words in the entire universe, well accept my Mum's of course. We've been training this week on Sunday and on Tuesday at our trainers house. Sunday, our trainer was at the regionals and needed us to tend to her sheepies. I just love to tend to the sheepies. And sooo want to know when Mum is going to get me on sheep again. All I got to do though was admire them at a distance and through the fence. But even with that, I had 'em moving, you betcha! Training has been going well. Mum says I've been super speedy, and it feels like she's handling yet another dog. It's been cooler around here lately and I just love that cool weather. We haven't had a trial in a few weeks, and have to say we are really looking forward to the next six weekends in a row. This weekend, we are off to Ohio for three days. We'll be driving back and forth, 'cause we have to get back on the horse (as they say) after our car accident. Friday is just Exec level, so we can go later and come back earlier. This weekend we are going for the MX, MXJ - just need one more Q in each - Jumpers and Standard. Our Q rate is sitting at about 65-68%, so the odds are good that we'll get it. Paws crossed! Mum says once we get that, it's just off to the MACH title which will be awhile. So she's decided after I get my MX, MXJ, she's going to be pushing me harder and faster than ever, 'cause at 16 inches, it's sometimes hard to get those MACH points built up. Most folks would say, well how come she's not pushing me all the time? Yep, good questions. But I have to say that we feel we've just recently got our rhythm down, Mum knows what I can do know, and I'm working much more independently. So she can push me now. And I've only been trialling for about 18 months for goodness sake! Mum tells folks that I'm a good boy, 'cause when we're off our game, we at least do it all in one day. And we're we on we do that in one day too, so we've been able to accumulate I think 6 or 7 DQ's so far, out of the 9 MX, MXJ legs. We're really happy with that. After this weekend, we have another AKC trial, then the final USDAA for the year (can you say "I want my MAD this year"! ), then three more AKC trials in a row. Should make for an interesting Fall! Since Mum's been thinking so much about keeping me in good physical shape, she's also been thinking about how she can keep herself in good shape. Since she runs me, she has to run pretty hard. And now that Gracie is keeping her speed up in both practice and competition, Mum needs to be in the best shape possible. Running two dogs, is a whole other ball game than running just one. So as part of my training plan, she's working in activities that she can do with me (and Gracie), and also looking into some weight loss tips just to make sure she doesn't put any lbs. on this Winter. Luckily she's in pretty decent shape and just has to watch herself when her activity declines, eating more fruits and veggies, cutting back on the indulgences, that type of thing. Hey agility handlers? What do you do to keep in shape? Dog blood donors save lives! Have you ever wondered how all those pups that need lifesaving procedures get the blood they need during surgery? We wondered about that, so we did a new Squidoo lens on dog blood donors, those saved by blood donation, and how the whole process works to get those pups the blood they need. Check it out and see how you may be able to donate blood at your local blood bank or blood drive. Mum's birthday is coming up next month, and she's getting older! Remind you, she's not that old yet, but it's just close enough that she thinks about the big numbers sometimes. Hopefully it's true that 40 is the new 20 and 50 is the new 30, she'd like that. She has told me though that she wouldn't want to go back to 20 or 30 for any reason, whatsoever! She likes her life now, has much more experience, and thinks a lot differently about life than she did when she was 30. Risk? We'll take it. Fear, not in our vocabulary. Wherever life takes us, is where we want to go; but hopefully the direction would take advantage of our talents! She does look in the mirror now and then, and isn't that happy about the age thing showing more and more on her. Lots of people think about doing some stuff and having Beverly Hills plastic surgery done. It may be for some folks, but not for my Mum. I like her just as she is. For the serious canine athlete! Since my serious injuries, Mum has been thinking a lot about how to keep me in tip top shape for agility. And she's been talking with folks about putting together a training program for me, especially since Winter is just around the corner. She's been doing a lot of research on the Internet, looking for information on strengthening, conditioning, stretching, nutrition and other subjects related to keeping the me fit. What she found was pretty amazing; a whole bunch of articles on keeping us pup athletes at our best. To organize it all and to share it with folks, she put together a Squidoo lens, just for the canine athlete. It lists all kinds of info from training and gait analysis, conditioning, and nutrition, to available related books, dvd's, injury prevention and lots of other articles. This lens is for the serious canine athlete. So all you agility, flyball, disc dog, schutzund, earth dog, and other sporting canines, check it out. We're sure you'll find some great info. And if you find additional articles that would be great to add to the lens, just let us know, K? Thank you MaxDogPhotos.com for the photo. The AKC Agility Invitational, AKC/Eukanuba National Championship and the National Obedience Invitational will be here before you know it. They will be held in Long Beach, CA, December 1-2. Only the top five agility dogs in each of the AKC recognized breeds are invited to the agility invitational. A few of our buds that we train and trial with were invited this year, including Buster Brown, one of the top ranked Am Staffs in the country in both AKC and USDAA. I can't wait to see how they all do and hear all about their trip, runs and the fun they had. I will be sure to direct them to this California travel blog, so they can get to know the area more, and find some fun stuff to do when they have some free time - if they have some free time! The other day Gracie, Mum and I were watching TV and this commercial came on the talking about hair replacement. It got me to thinking... after my experience getting attacked by those dogs a couple of years ago, I've had a bald spot on my back. It's where they took a big chunk out of me and when it healed the hair never grew back. I bet all kinds of people don't have hair for loads of reasons. Because they are older, because they got sick or had an accident, or because they genetically lost or never had their hair. And I bet they feel like I do, a bit self conscious, at times. I am lucky, cause I have kind of long hair and I can do a 'comb over' and no one sees my bald spot, but humans just don't have the luxury. Dave Berry talks about hair restoration and how his dog's spit may just be the cure! All about hairless dogs - think they are self conscious? An interesting site that talks about why humans have hair, dogs could learn a lot from this! Why is some hair curly and some hair straight? Locks of Love - a non-profit organization that provides hairpieces to children suffering from medical hair loss. The Plague Dogs - The Movie! We were at it again, yep, gettin' sucked in to YouTube. And guess what we found this time? An entire animated movie about us pups. It's called The Plague Dogs. The Plague Dogs is a 1982 animated film based on the 1977 novel of the same name by Richard Adams. The film was written for screen, directed and produced by Martin Rosen, who also directed Watership Down, the film version of another novel by Adams. 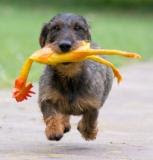 The film's story is centered on two dogs named Rowf and Snitter, who escape from a research laboratory in Great Britain. In the process of telling the story, the film highlights the cruelty of performing vivisection and animal research for its own sake (though Martin Rosen said that this was not an anti-vivisection film, but an adventure), an idea that was only recently coming to public attention during the 1960s and 1970s. Click here to learn more about the movie. Here is the first of the 10 vids that make up the movie. You can see all the vids in order here! Saturday is Puppy Mill Awareness Day! This is Top Secret, an adult terrier who was used as a breeder at a Missouri puppy mill. Due to a lifelong lack of veterinary care, Top Secret suffered from painful and severe dental infections. All of his teeth rotted and he lost part of his lower jaw. Top was rescued and has been treated, but he can no longer shut his mouth all the way and does not have full use of his jaw. Top Secret has now been adopted into a loving home. This Saturday is Puppy Mill Awareness Day. Throughout the World there are thousands and thousands of breeding facilities that produce puppies in incredibly large numbers, with the sole purpose of selling these pups to the public through the Internet and newspaper ads, at auctions, or to brokers and pet shops. The problems with puppy mills are the extensive over- and in-breeding of these poor pups, the lack of medical care, poor food and shelter, overcrowding and sometimes killing of unwanted animals. There is much suffering occurring in these horrible places, and the suffering often continues outside through inherited genetic diseases, illnesses and afflictions. So much needs to happen to stop this cruel practice. What can you do right now? Stop buying pups from pet stores, and don't buy a puppy through the Internet or advertised in a newspaper ad, and tell your friends to do the same. Get your next pup from a dog shelter or rescue or a well-screened reputable breeder. Contact your member of the U.S. House of Representatives and your two U.S. Senators, asking them to urge the USDA to strictly enforce the Animal Welfare Act and to support efforts to increase funding for USDA/Animal Care. Encourage state and federal officials to stop the mass production and exportation of sick and traumatized dogs. Share this flyer and spread the word about puppy mills. 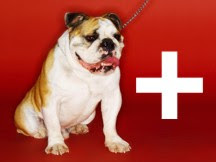 Read this and share information on how to find a good dog breeder! And download this pdf on finding and recognizing a reputable breeder. Below is a video showing the horrors of puppy mills. *Warning* this video contains distressing and upsetting footage of animal abuse and neglect and should be viewed with caution. Tish of The Kat House added me to Priscilla Palmer’s Personal Development List. Thanks so much, Tish! This sure is a great list of blogs! Once you have been added to the list, let Priscilla Palmer know. Add this list on your own blog. For an easy way to transfer the list to your site, click here. Tag any blog you feel can benefit us in our growth process to be added to the list. Don’t forget to add yourself to the list when you post! Troy Worman at Orbit Now! Vladimir Rundan at Living is Great!